Our doctors are expert in the treatment of carpal tunnel syndrome. Whether you have just begun to experience symptoms or have been putting off treatment for a while, you have come to the right place. Our carpal tunnel doctors will help you to get your condition properly diagnosed and explain all your treatment options. 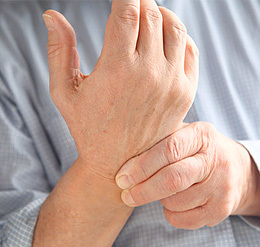 Carpal tunnel syndrome is a condition, which affects hands and forearms. The symptoms of carpal tunnel syndrome include pain and cramping of hands, tingling of the fingers, which wake people at nights and makes them want to “shake-off their hands”. In more severe cases, carpal tunnel syndrome can also result in weakness of the hands to a point that people involuntarily drop objects. As carpal tunnel progresses it can also cause cramping and pain of the forearm, arms, and even the neck muscles. Prevalence of carpal tunnel syndrome in the US is 7.8%, or one out of every 13 Americans (Scan J. of Work Envi, Sept. 2013). This incidence is even higher among working people, and has been reported to be up to 25% among people whose work involves extensive date entry. According to the New York Times, “every year more than 500,000 people in the US undergo surgeries for carpal tunnel syndrome”, with an associated cost in excess of $2 billion per year. What causes carpal tunnel syndrome? Repetitive wrist movement, such as typing, twisting, and turning of the wrists. Natural thickening of the carpal ligament. Wrist fracture can cause a shift of the wrist bones, thus resulting in the narrowing of the carpal tunnel. Ganglion cysts in the wrist can put pressure on the median nerve. Inflammation and swelling of the wrists from pregnancy, weight gain, etc. Diabetes Mellitus. 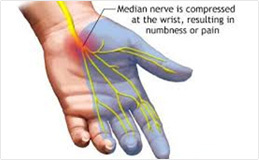 Gout, and other metabolic disorders can damage all nerves, including the median nerve. Depending on how advanced your condition is, you may be eligible for treatment using non-surgical methods. For those cases where surgery is necessary, our doctors specialize in minimally invasive techniques. No matter what treatment you require, you can rest assured that you will be in good hands here at the Hand & Wrist Center Los Angeles. There are several tests performed during a physical examination that can help to diagnose carpal tunnel syndrome, along with a reliable history of symptoms. Electrodiagnotics tests, such as EMG/NCS; as well as Ultrasound can help to confirm clinical diagnosis of carpal tunnel syndrome. Cases of mild carpal tunnel syndrome can be treated non-surgically with NSAID, splinting, physical therapy, acupuncture, and a reduction in repetitive hand use. Mild to moderate cases of carpal tunnel syndrome can be treated with steroid injection into the wrist, although the results are temporary. 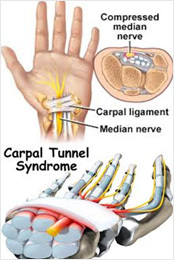 Moderate to severe cases of carpal tunnel syndrome are most effectively treated with carpal tunnel surgery. Dr. Sean Younai and Alarick Yung are Hand surgeons who have successfully treatment thousands of people who suffer from carpal tunnel syndrome. To schedule your consultation with Dr. Yung or Younai you can schedule a consultation or call us at 818.386.1222. Doctors are available to see patients in the counties of Los Angeles, Ventura, Bakersfield, and Riverside. We accept most insurances, and are providers for basically all of worker’s compensation MPN panels. Select one of the options below to learn more about Carpal Tunnel Syndrome. Symptoms of carpal tunnel syndrome usually start out as minor discomforts and can become gradually more obvious with time, leading to pain and loss of dexterity. If you believe you are suffering from carpal tunnel, it is recommended that you complete an examination with a qualified carpal tunnel doctor in order to determine which treatment is best for you.